Some stories begin at the End. 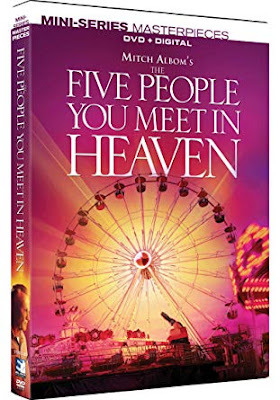 From the author of the phenomenal #1 New York Times best seller comes the original screen adaptation of Mitch Albom's The Five People You Meet In Heaven. This New York Times best seller is brought to life by an award-winning cast including Jon Voight, Ellen Burstyn, and Jeff Daniels. The NY Times praised it for its "genuine power to stir and comfort." Mitch Albom's The Five People You Meet in Heaven explores the unexpected mysteries of the afterlife by reminding us what really matters here on Earth. Five People You Meet in Heaven is the story of an older man who dies unexpectedly. He has been lonely in the last years of his life, but when he arrives in the afterlife, he is greeted by five unique people. The five people that this man meets are unexpected, but they show him the impact that his life has had on others. It all takes place at the amusement part where he worked. This book really spoke to me, and I was exited to see it was made into a mini-series that stayed pretty close to the book. It's a great movie to watch if you are dealing with the loss of a loved one or struggling to understand your place in his world. For me, its even more meaningful because I grew up in a tourist town. If you want to grab a copy of this heart-felt mini series, you can find it online at Mill Creek.